I had the privilege of sitting down with my friend Sanjay Parekh (from Startup Riot) to discuss how to get the most of startup events. In this interview we talk about how Sanjay went from being an introvert, to a networking machine. Sanjay discusses how he was able to get his first customer (because of an event for entrepreneurs), how he got press for his startup, and built connections with investors. You can read the highlights below the video. If you see someone at all the events, chances are they don’t have anything of value. 2. Meet new people. It’s not “networking” if you just play on your iPhone the entire time. Be willing to get out of your comfort zone, and meet new people . 3. Be an extrovert. Meetups are designed for extrovert. No one is going to think you’re weird if you go up to someone you don’t know and start talking shop. You’re all part of the club. 1. 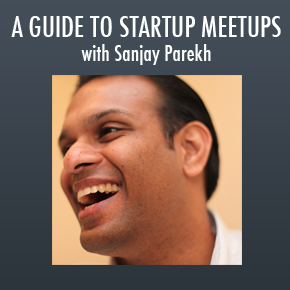 Show up – Sanjay went to a meet up. You have to get out of the boat so you can walk on water. 2. Have something to talk about when people ask you what you’re working on. Work on your elevator pitch. 4. After a potential customer saw the article, they called Sanjay up and were asking to use their service. How do you build a relationship with an investor your meet at an event? Investors don’t invest in people they don’t know. Don’t expect an investor to wip out his checkbook right after you meet them. Instead, try to build a relationship. 1. Talk to them at the event. 3. Whenever you hit a milestone, let them know. Perhaps you reached a 1,000 signups. Maybe you signed a huge customer. Your goal is to demonstrate progress. 4. If you’re kind, courteous, and working on something they believe could be successful, investors will often try to help you (Even if it’s not a monetary investment). Just remember that they don’t owe you anything. Sanjay now runs Startup Riot. If you’re in Seattle, Washington on August 24, 2011, Startup Riot is the place to be. I’m planning on attending and would highly recommend you do the same. For more startup news, follow us on Twitter @startupfoundry, or on Facebook. Next Next post: Moment of Clarity – Why Being in the Trough of Sorrows is a Good Thing.